If you ask any users who wants to use one computer with other family members, then You will hear without any doubt that he/she will buy a new computer. But, now there is no need to buy a full set of computer equipments, just purchase a set of keyboard/mouse and monitor. ASTER software will create two workplaces from one computer in home or office and allow two user to work together in one computer. ASTER program is a cost effective way to get an additional workplace at home. You need buy a monitor and connect to a standard desktop computer or laptop. Our innovative software organizes the sharing of one computer and allow up to 12 workplaces to be create from one computer system. What you get is a completely independent computer experience to each of your users. In addition, to making use of 2 monitors, keyboards/mice, you can also save space in your home and also reduce noice levels as well as reduce the production of harmful radition from computers and electricty consumption as there is only one computer system. 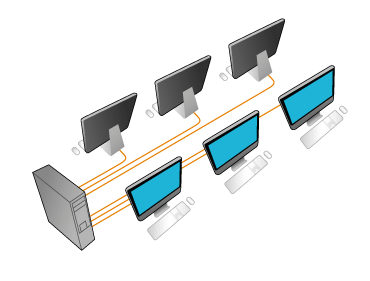 If you use ASTER software, you will be surprised to see how easy it is to connect an additional monitor to the computer, you can even use your TV as monitors if it supports connection to the computer. Unlike using thinclient or terminal station which are slow and give mediocore performance, you will be amazed to see the excellent performance you get at your workplaces using ASTER. You can even game on the system if your graphics card supports it.